Since opening in 1996, more than 3,000 young men and women have earned their high school diplomas at Ombudsman Arizona Alternative Charter Schools. The Class of 2018 saw 306 students earn their diplomas – our largest graduating class ever! 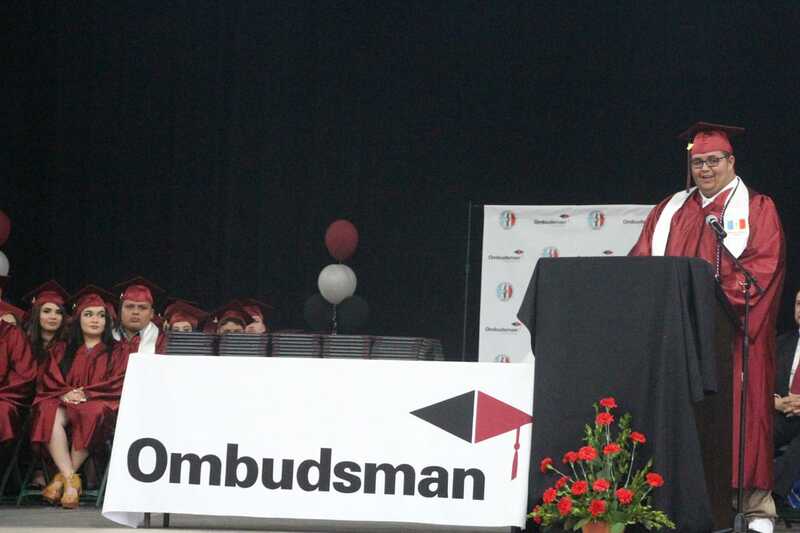 For many students, Ombudsman offers the best path to help them overcome personal, economic, or academic challenges as they work toward their degree. We’re featuring the commencement speeches of four Tucson-area graduates from the Class of 2018 here on the blog this month. This is Adrian Valencia’s Ombudsman Arizona Charter success story. “Good evening family, friends, distinguished guests and faculty. My Name is Adrian Valencia and on behalf of the class of 2018, we’d like to thank you for coming and sharing this special moment for which marks an official starting line for adulthood. Fellow Graduates, we made it. All of our hard work has come down to this very moment. These past years have been the fastest and most dramatic years by far. From waking up late and sometimes showing up to class looking like a zombie, to the days where we celebrated another school year gone by, we did not let obstacles stop us from receiving our diploma. Personally, high school was a challenge, and I’m pretty sure we all can agree that is was not always an easy road. Our school in general went through a lot of change, some bad but most of it being positive. In our community we have been taught how to be young role models for the future generations. We had people from all over the world visit Hiaki High including the Prime Minister of New Zealand, our very own Mayor of Tucson, Mr. Rothschild, and many more because they wanted to make sure that we knew there are people who support us and care for us and our futures. If you have noticed, I keep repeating the word “we” because, without classmates and teachers, this moment would not be possible. Friend or foe there was always someone there and maybe just maybe you had the same answers as them if you know what I mean. I am going to miss the drama not because it was entertaining but because I was a part of it sometimes. We experienced the death of a hero, poor Spider Man, it hurt so bad watching him fade away and then there was getting that first Victory Royal on Fortnite. Over the years, some of you at Hiaki High turned into family, while half of you literally are my family. I thank you all for making high school memorable.